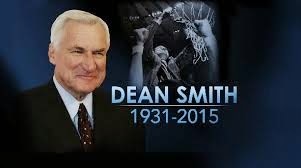 "I thought I'd share this little story with you from the Dean E. Smith memorial service last Sunday. My wife and I were lucky enough to be in the area and had the chance to go. It was a beautiful service for a true leader of North Carolina culture and students for many decades. At the beginning, Woody Durham politely recognized that Pat McCrory and Thom Tillis were in attendance, sitting side by side, no less. After nearly an hour of the service had gone by, I looked down on the court to see that both McCrory and Tillis had LEFT. They left before Dean's preacher had spoken, before the benediction, before the Alma Mater. Where did those two have to go that was so important they couldn't finish a Sunday afternoon service for a North Carolina legend? That really burned us up, and I thought someone else should at least hear about it."